In 2010, the school was so dysfunctional and unpopular that many in the district thought the best thing would be to close it down. Jefferson avoided the chopping block, though, and doubled-down on programs that were working. Principal Margaret Calvert says that after the school was saved, they redesigned it by looking at the programs that were already seeing success at Jefferson. If its working with 10 percent of our population, why wouldnt we offer it to 100 percent of our population? Calvert says. So, over the past few years, the district invested several million dollars in the wrap-around services offered by nonprofit Self Enhancement Inc., ushering in its Whole School Model. It also deepened partnerships with Portland Community College and Portland State University to offer college-credit courses directly to high schoolers. Last year, graduation data showed the additional investments are paying off, with a remarkable 14 percentage point year-over-year jump, to an 80 percent graduation rate. The first cohort of students after the school redesign had graduated, and they were on the way to success. On Monday, June 6, Jefferson leaders hope all 107 seniors in the Class of 2016 will graduate. Colt Gill, Oregons newly hired graduation czar, says he will be on the lookout for programs that can be replicated around the state. Gill, who started June 1 as Oregons first education innovation officer, says Jefferson is already on his radar as a program that works. They are doing pretty incredible work tying students to that next step, Gill says of Jeffersons link to higher-education options with PCC and PSU. As he was finishing up the fiscal year as Bethel School District superintendent, Gill says getting kids to graduation means getting them to class consistently. Kids have to have a desire to come to school every day, he says. It could be drama, it could be a sport, it could be any one of those things that we are really lacking in Oregon because of our resources and the focus on the (academics), he says. Gill says that another trouble spot is a lack of cultural relevance and sensitivity, as predominately white, middle-class teachers  devoted as they are  teach an increasingly brown and black student body. He says the question of finding educational programs that work for this generation of Oregon students is imperative to the future of the states economy and the success of its workforce. Self Enhancement Inc. (SEI) founder Tony Hopson  Jefferson class of 1972  says his 35-year-old Portland-based program could easily scale up to a Whole District Model or even a Whole State Model. So how do they do it? Long hours of tutoring? Some new education technique? A stronger curriculum? In fact, Hopson says, the missing piece in struggling kids lives has very little to do with academics. Asked if it should be the governments job to provide what amounts to parental support, Hopson says it is by far cheaper than the alternative. We can all stand around and point fingers about whose responsibility it is, but the ills on the back end are so much worse, he says, noting the high costs of incarceration, welfare and delinquency. Hopson says there are two key elements in an effective program. First, recognize that every kid has a gift, so try to figure out what it is. Second, recognize that every kid stumbles, so have an adult there to put him or her back on track. Hopson says the answer is the same if the student is black, white, poor, wealthy, urban or rural  all across Oregon. Calvert has worked at Jefferson five years as principal, and eight years before that as vice principal. She sees todays students talk about the future in much more concrete and realistic ways than in the past. Part of that has come through actually taking college courses through PCC or PSU and learning the lingo. Kids are learning to navigate credits, transfer processes and university course catalogues in addition to the subjects they study, Calvert says. If she had advice for other principals or school systems looking to boost graduation rates, it would be this: Let a program mature and keep refining it year after year. Calvert says it was tricky to get PPS, PCC and PSU to mesh together  everything from how students could arrive at the Cascade Campus across the street to how courses could align with college curriculum had to be worked out. The vertical alignment to the college  we have really focused on that and I think thats been really successful, she says. Michael Belcha, an 18-year-old senior at Jefferson, says he loves Jefferson and credits Self Enhancement Inc. with his success and that of the rest of the school. He and his friend Arabella Zook have been in SEI since they were in second grade. Its very good program for students to stay involved in and stay out of trouble in the summertime and stuff, Belcha says, noting that through the program he has visited several countries, states and college campuses. Belcha, whose mother and several other family members also went to Jefferson, says even before the redesign Jefferson was a beautiful place. Belcha has earned 13 college credits already and has a 4.0 grade-point average. 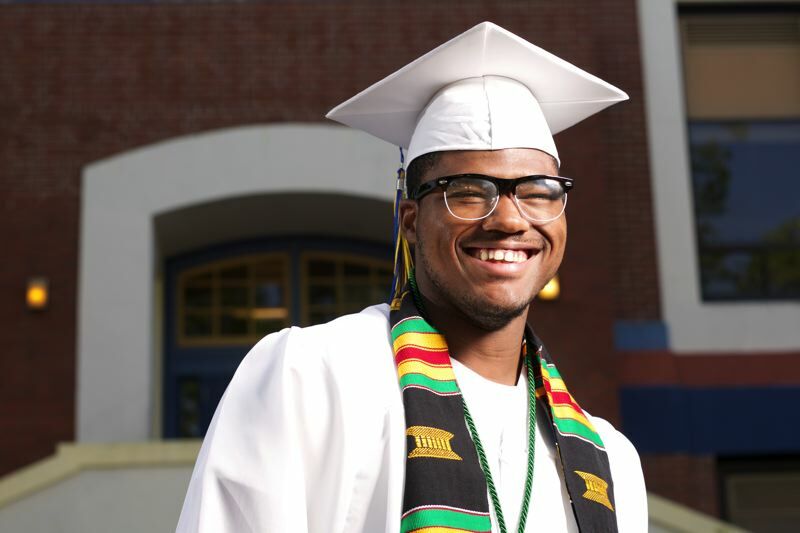 He wants to study business and photography at either the University of Oregon or Morehouse College in Georgia, which is a historically black, all-male private school. We have been knocked down for many years of being just outrageously discriminated (against) and now we are shocking the world with these crazy graduation rates, Belcha says. But as Portland continues to gentrify, Jeffersons longtime title as the states only majority-black high school may soon fade away. District officials would not confirm by press time, but for the first time in recent memory, the freshman class is rumored to be majority non-black. NOTE: This story ran in the June 2, 2016 Portland Tribune under the headline "Jefferson revival takes hold." Portland Public Schools may be a misnomer if one measures public by how easy it is to get inside one. As the school board gears up to adopt a budget of more than $1 billion in taxpayer money  including general funds, bonds and earmarked grants  taking a look inside to see where all that money is going can be difficult for an independent observer. The Portland Tribune first made a verbal, in-person request to visit Jefferson High School to former PPS Communications Director Jon Isaacs on Feb. 17. When PPS spokeswoman Christine Miles replied with a phone interview appointment on March 24, another request was made to visit Jefferson in person. Six requests later, to Calvert and Miles, a Tribune reporter and photographer were finally allowed inside to talk to two preselected honors students on May 17. Last summer, it took from Aug. 12 to Sept. 28, and increasingly insistent requests, for a Tribune reporter and photographer to be allowed inside the Clarendon Early Learning Center for a story on preschool education.